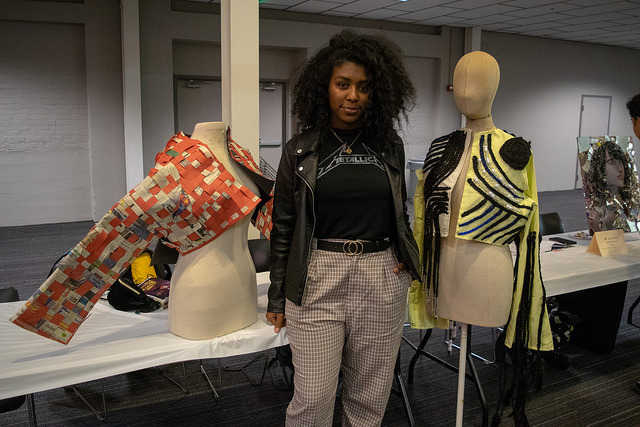 High school students from across Maryland impressed and awed state leaders with their creations for the 17th annual “Rethink Recycling” Sculpture Contest. This year, 62 entries from 23 schools across the state were on display. Maryland’s First Lady Yumi Hogan and Department of the Environment Secretary Ben Grumbles awarded prizes for a horse made from drawer pulls and jewelry, a cardboard human head, and high-fashion clothing, all made from unwanted trash. Overall winner Mary Garrison of South Carroll High School made her “Golden Mare” sculpture out of jewelry, drawer pulls, cardboard and other materials. The Creativity Award went to Huy Nguyen from Towson High School, for “The Face of Hoy,” a lifelike portrait using nothing but cardboard and hot glue. Students from 23 schools across Maryland entered sculptures in the contest. The artists came from every corner of Maryland, with winners from Baltimore County to Garrett County. Mary Garrison from South Carroll High School in Carroll County was the grand prize winner for her sculpture “Golden Mare” made using gold metal objects, necklaces, cardboard, wire, and a drawer handle. She received a Dell laptop and four passes to the National Aquarium for her efforts. Bluetooth speakers, wireless headsets, and $100 Amazon gift cards were also awarded as prizes. Maryland residents and businesses recycled more than 3.2 million tons of waste in 2017 and achieved a waste diversion rate of nearly 50 percent, surpassing the state’s goal.